NEW STOCK JUST ARRIVED AND IN SIMPLY SUPERB CONDITION WITH JUST 1 PRIVATE OWNER FROM NEW. FINISHED IN 'BOOST' BLUE METALLIC PAINTWORK. 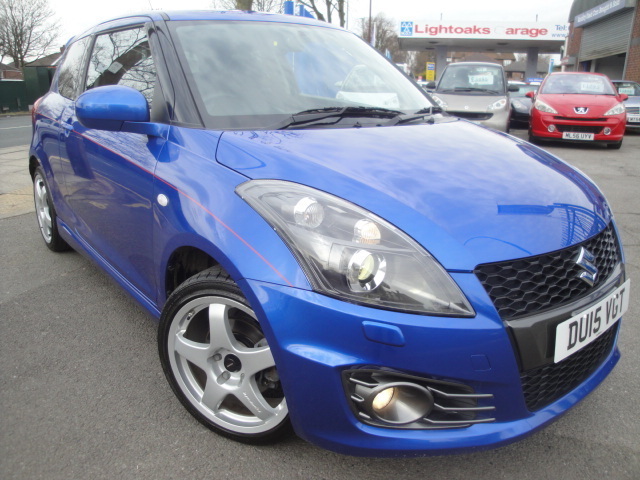 THIS SUZUKI SWIFT SPORT HAS A GREAT OVERALL SPEC INCLUDING SAT NAV, BLUETOOTH CONNECTIVITY, CRUIES CONTROL, KEYLESS ENTRY AND GO, POWER FOLD WING MIRRORS AND CLIMATE CONTROL. FROM THE OUTSIDE THE CAR ALSO LOOKS EVERY INCH THE PART WITH UPGRADED ALLOY WHEELS AND REAR SPOILER. THE ACR ALSO COMES WITH FULL MAIN DEALER HISTORY HAVING BEEN SERVICED AT 3803, 6673 AND 8788 MILES.